To best enjoy Bracciano lake (Lago di Bracciano, in Italian), visit the lakeside town of Trevignano Romano, just 1 hour North of Rome, Italy. I love my walks along the recently upgraded and beautifully refined waterside at Trevignano, where gigantic pine trees filter the sun above your head as you stroll along. Under the trees are park-like patches with flower beds and benches, alongside the path of beautiful pavers keeping you right along the water’s edge. 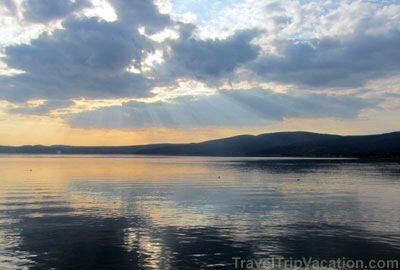 The views of Lago di Bracciano are expansive and unobstructed. It is a calm lake where, more often than not, the other side disappears, being shrouded in a mist just above the water surface. Making you more aware of the swans which swim together right in front of you. It is that sense of calm and softness of color which transport me back to the Boardwalk in West Vancouver, Canada, where I went in prior years. There, the view of the water is of an ocean instead of a lake the size of a volcanic crater. But it does not matter, as both waters are equally misty and shine with the same amazing color scheme of blues and harmonious calm hues. They ooze tranquility. And there, where the serenity and the beauty of the lake captures you, often, rainbows or cloud-rays remind you of the omnipresence of the Divine. What a miracle place we live in.